Friday 28. Had command of our regiment, because the Colonel went to Vicksburg with Captain John who went home on a leave of twenty days on acc. of his wife's illness. She is reported to be insane. Poor woman! I pity Captain John also, for he loves her fondly. Saturday 29. Frank is not any better, I fear he is going to have a serious time. The heat is increasing and so is the sickness of the camp. I wish I knew how to prevent disease among the men. The news from all quarters is rather stale, no great movement going on anywhere, save at Charleston S. C. where Gilmore works. Sunday 30. This was a very lonely Sabbath. We had no divine service, spent it mostly in sleep. Monday 31 Our regiment was inspected and mustered for pay. The inspector complimented my company very highly; he remarked "your company has its arms in better condition than any that I have seen. I worked quite hard to finish my muster and pay rolls properly. 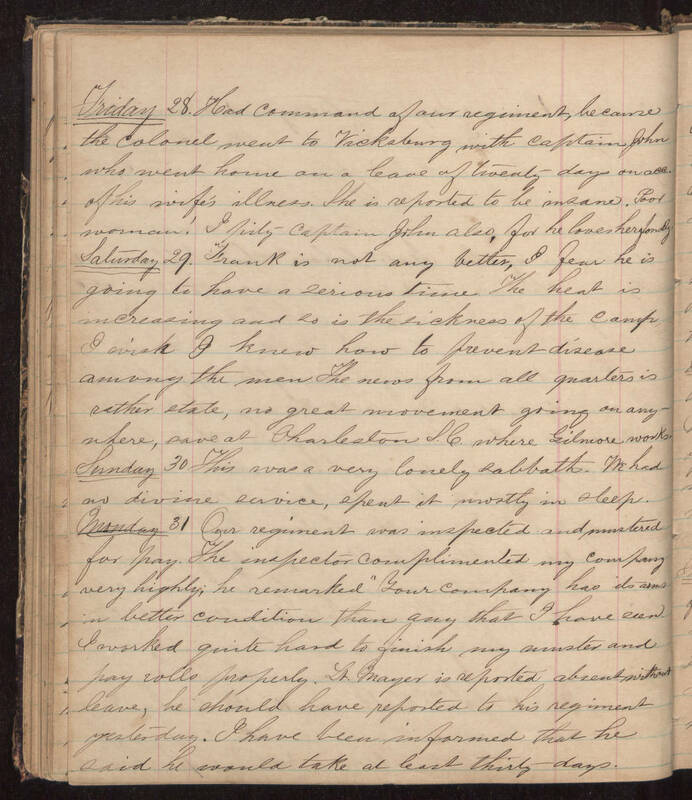 Lt. Mayer is reported absent without leave, he should have reported to his regiment yesterday. I have been informed that he said he would take at least thirty days.